Love Fur Dogs was founded on the understanding that dogs have a unique co-evolution with the human race and that no two species on Earth are closer! Dogs are extraordinary creatures whose bond with us runs deep and who can read us like a book. All pets play a special and often therapeutic role in our lives. Our mission includes a special devotion to serving any special needs of both our human and pet clients. As a high school teacher for 25 years, I worked closely with students of widely varying physical and mental ability levels. Early in my life I embraced (I’m a long-time Star Trek fan), the Vulcan motto of Mr. Spock’s people “Infinite Diversity in Infinite Combinations” and I truly love all the joys and challenges of our diverse world and it inhabitants. People come in all shapes and sizes. Animals are equally diverse! We have heard from some of our beloved customers that some grooming businesses were not able to groom their special needs dog. Our commitment is to do our very best for ALL pets – they all deserve to be kept clean and healthy. Every dog and cat CAN and must be groomed. Those pets that are geriatric, very young and not yet trained, sick, or injured, highly sensitive or clunky as a bull in a china shop – they ALL need to be groomed. All dogs need to be groomed, just like all people need and deserve appropriate care. Most dogs do need to be professionally groomed regularly. Yet dogs vary widely in coat, size, temperament, and training, and many have allergies, parasites, fungal and bacterial infections, and other coat and skin health challenges. From the 175-pound hairy mass of a Black Russian Terrier, to the smallest smooth coat Chihuahua, professional groomers handle all the coat types, and all the various personalities. It is certainly never dull work! Some pets also have special needs. For example, almost half of all dogs groomers see are senior citizens. These geriatric pets can struggle with aches and pains, temperature sensitivity, as well as experience a diminished mobility and diminished tolerance to standing or sitting. For our staff, identifying and accommodating these special needs is at the top of our priority list. It has broken our heart to hear from clients who own and care for special needs dogs that they have been turned away from other groomers. These are challenges to be met – we just need to sometimes apply a little creativity to get the groom done. Maybe it will mean the owner will stay for the groom, or the pet has to be groomed after hours, or in your home. Maybe it means an Express Groom early in the morning, or helpful medication from the veterinarian. Whatever the solution, we will work the challenge until we find the way forward. Puppies need specific, gentle training and a positive socialization to the grooming process. For this reason, we offer a VIP (Very Important Puppy) four step training groom to all puppies beginning at 8-10 weeks. They will get to sniff and explore around the shop and experience in a safe, fun, and lovingly protected way all the sights, sounds, and smells of our grooming shop. We only use the easiest methods on these first-timers. 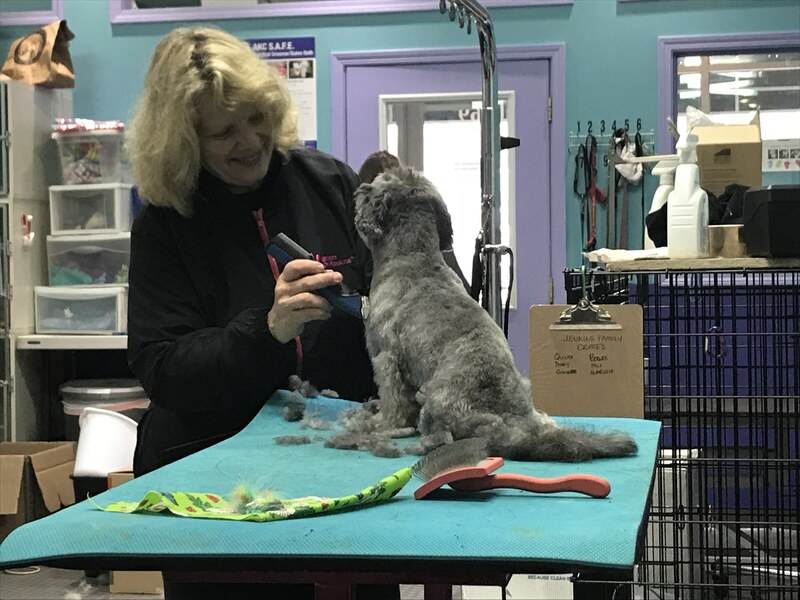 What we have seen many times is that this positive first experience pays off in a lifetime of comfort with the grooming process for that dog. The health, safety, and comfort of our four-legged client is first, last and always what we are about. Dogs can also come to us after injury, surgery, with other health issues. We have special supports and accommodations for these differently-abled pets. We regularly serve paralyzed and blind pets, among other issues. We welcome the owner to stay during the entire groom, by advanced appointment. 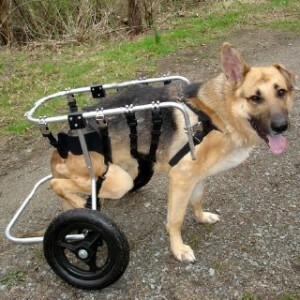 This often can help set a disabled pet at ease. Each grooming service is individualized to the needs of a particular pet. We perform a six point eyes and hands on well-being check and refer owners to their veterinarians for any issue that may be discovered. The six points include skin and coat, feet and nails, teeth and gums, ears, external parasites, and the rectal area. Often groomers will see things that owners do not, and that can really help in partnership with the family veterinarian to keep the family dog healthy and happy for a long, full life. I have found that the dogs I groom really sense that I have their well being at heart by the way I adapt their handling and grooming to their special needs. So come to us with your special needs, and your love for dogs. We know you will sense what is different about Love Fur Dogs when you walk in the door. Lets see what miracles some love can accomplish!